Please tell me that I'm not alone in wondering where to begin with test preparation. Do you start with the basics such as computation? Problem solving? Technology skills? Ahhhh! It can be overwhelming, and time is so precious. Last year, I began an intervention that I truly believe highly impacted my students' test scores last year. In my classroom last year, I had an array of kids. I had six students with identified disabilities and four more who had strangely slipped through the cracks (you know the ones I'm talking about :] ). Despite all of that, 100% of my students passed Indiana's state mandated test, ISTEP. When I saw my scores this year, I knew my intervention had been a huge factor in their success. So after winter break, I knew I had to utilize this intervention once again this test taking season. I arranged the task cards in a pattern based on my grade level computation standards. Each day, I sit out one problem from the rotation. As part of our morning procedures, my students solve the problem and drop it in the bucket. During our study hall time later in the day, I work out the problem, and sort the problems by correct and incorrect answers. If they have the problem correct, I place a check next to their name. As they return their practice pages the following day, I put a star next to their name. At a quick glance, I can see who consistently answers problems correctly (checks), incorrectly (stars), or did not complete homework (completely blank). For students who do not correctly answer the question, I give them a coordinating practice page for homework. I love this intervention because it targets only the students who need the practice without taking away precious class time. Each page includes a QR Code that allows the students to check their own work before turning it in. So here is the data from my class last year! In my first round through basic computation, I had MANY errors. The majority of my students made really simple mistakes, such as not reducing a fractional answer. By round three of our rotation, you can see that the number of students receiving additional homework is significantly less. At we continued cycling through these basic computational skills, the numbers continued to drop! I had a parent question why I was using ONE question to determine if they needed additional homework on that particular skill. After all, no one is perfect. My justification is that there may only be ONE problem on high stakes testing that determines if they know how to complete this skill. I need them to be able to demonstrate in only ONE problem, what they can do! It also encourages students to slow down and double check answers. I often remind them that it makes more sense to take your time on that one problem than to rush through and receive additional homework. In many cases, my students answers are very close to the correct answer. For example, when we multiplied decimals, I had many students who had all of the correct numbers, but their decimal was in the incorrect place. On Indiana's standardized test, our questions are no longer all multiple choice. Many of our answers require the students to type in their answer. Meaning, it is 100% up to the students to compute and key in the correct answer. I really feel that this has helped the computation portion of this. Want to try this out for a few days? Click the image above to grab a freebie and utilize a few of the skills that fit your grade level! 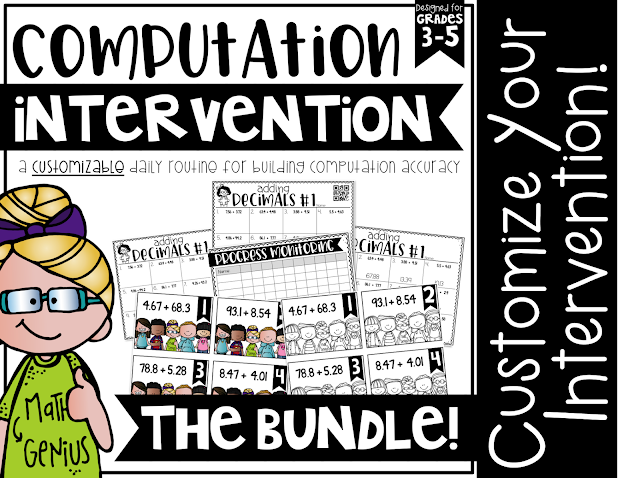 By clicking the image above, you can grab my Computation Intervention Club or choose custom products to build an intervention plan that will help your students the most. I have a long list of things that I'm working to add!